Rolls of fat on the back can be a significant source of embarrassment, but an upper body lift can correct these issues and make you feel confident in your own skin. Following significant weight loss or with aging, multiple rolls can form on the back as a result of excess skin and fat in this area. 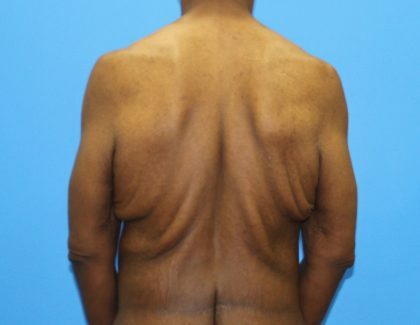 This often results in what is called an “inverted-V” deformity where the rolls extend out from the middle of the back extending in an inferior and outward direction. These rolls can be a source of embarrassment causing you to keep a shirt on in warm weather or by preventing you from wearing certain cuts of clothing. For women, these rolls can also cause issues with wearing a brassiere. The upper body lift is the main procedure used to contour the upper and lower back. Following this procedure, you will have a dramatic improvement in the contour of back. In many patients, this procedure is performed in conjunction with an arm lift or breast lift. There are several techniques to help you obtain the contour you desire. During your consultation, Dr. Michaels will carefully listen to your concerns and create a treatment plan that will allow you to achieve your goals. Dr. Michaels is a renowned plastic surgeon and an authority in body contouring. He has completed one of the few fellowships dedicated to this specialized area of plastic surgery. 1 weeks back at work. 1 week light exercise. 2 weeks more strenuous activity. 8-12 weeks for swelling to resolve. Patients travel from throughout Washington D.C., Maryland and Northern Virginia to seek treatment at Dr. Michaels’ Bethesda practice. 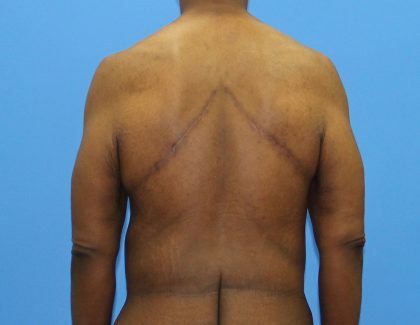 If you would like to learn more about the upper body lift, click here or call (301) 468-5991 in Bethesda, Maryland or (703) 957-8610 in Fairfax, Virginia to schedule a consultation.